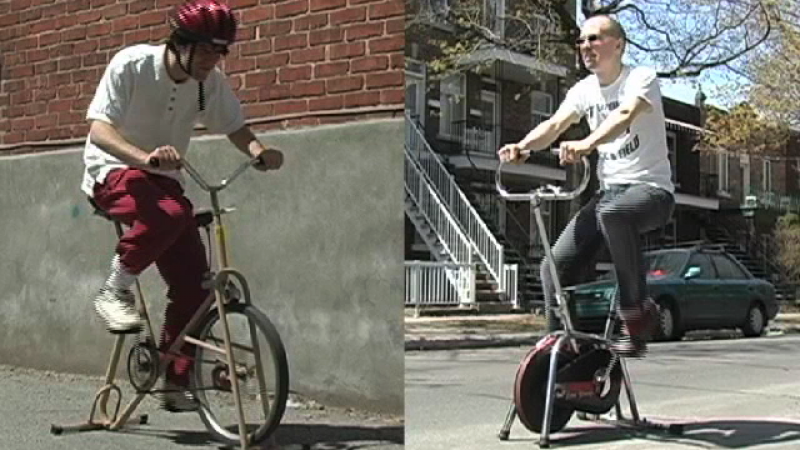 Vélodrame is an interactive installation with two exercise bikes. The relative speed of the bikes is used to generate a pseudo-conversation between two characters. Vélodrame is an interactive installation with two exercise bikes. The spectators are invited to peddle: their combined action controls an ongoing discussion on the screen. The relative speed of the bikes is sent to a computer program. By mixing pre-filmed video sequences, the software generates a pseudo-conversation between two characters. The sequencing of the movie sequences is conditioned by the interaction between the two peddlers. The assembled narrative refers to the conception of the piece itself.